Cornwall has so much to offer. It is famous for its seafaring history, spectacular sandy beaches, gorgeous gardens, dramatic coastline and captivating fishing harbours. The popular seaside town of Looe can keep visitors entertained all year round and retains its character as a bustling working fishing port. The level streets offer a mix of traditional souvenir, arts and crafts shops and restaurants. Day 1: We travel via the motorways and into Devon and Cornwall arriving in Looe for check-in at the Portbyhan Hotel. bustling narrow streets and a quaint harbour. Day 3: A full day to the Eden Project, an exciting attraction where you can explore your relationship with nature, learn new things and get inspiration about the world around you. As soon as you enter the Med Biome you’ll be greeted by those wonderful holiday scents of the Med. Trek through the steamy rainforest in the world’s largest conservatory. Day 4: A free day at leisure in Looe. Day 5: We depart our hotel after breakfast and return home. 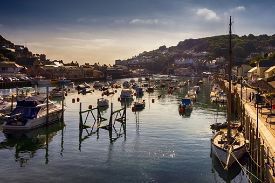 The Portbyhan Hotel is situated on the quayside overlooking the picturesque Cornish fishing port of Looe. The hotel is in an unrivalled position in the heart of West Looe. All of the bright and airy rooms at The Portbyhan Hotel feature a TV and tea/coffee-making facilities, hairdryers and ironing facilities and some rooms also feature balconies with river views. The bar at The Portbyhan features live music, as well as a games room with a pool table.